Welcome to this third podcast of Russian Made Easy. Let’s start by reviewing what we learned in the previous podcast. Imagine you’re at a cafe with your Russian friend. She comes back from the bathroom and sees that the food you both ordered has been served. Say each of the following phrases in Russian…out loud. Yes, this is your soup. So, how did you do? Did you remember to use the feminine version of my and your — that is, моя and твоя to rhyme with the feminine words like pizza and vodka? If so, you’ve already grasped a fundamental aspect of Russian grammar. The question I get is from all our non-American members. From Aussies and Brits and Canadians, eh? Not to mention from all our European members. They all ask, “Hey, what about us? How do you say: I’m Australian? I’m British? I’m Danish? and so on.” So, in this episode, we’ll talk about nationalities. We’ll learn to introduce our friends, and we’ll also dispel a common myth about Russian pronunciation. So let’s get to it. How would a girl say that? Well, Russian is kinda wishy-washy on this idea of having a male and female version for occupations. What I mean is, some occupations do have a male and female form – like student, teacher, dancer and singer. But many others have only one form, like doctor, engineer and author. This is Tony. He is an American. Это Тони. Он – американец. This is Jane. She is an American. Это Джэйн. Она – американка. Это Рассел Кроу. Он – австралиец. Это Николь Кидман. Она – австралийка. How about: She is an Australian. Alright, a quick review before going on. Say.. This is Steve. He is an American. Это Стив. Он – американец. This is Leyton. He is an Australian. Это Лэйтон. Он – австралиец. This is Sally. She is an American. Это Салли. Она – американка. This is Clara. She is an Australian. Это Клара. Она – австралийка. So what nationality is it? Well, in the movies, James Bond is perhaps the most well know англичанин. Meanwhile, Queen Elizabeth is certainly the most well-known англичанка. So, an англичанин is an English man. And an англичанка is a English woman. We’ll cut right to the chase on this one. A man born and raised in, say, Toronto, is a канадец. A woman born and raised there is a канадка. So the word for a Canadian male is….канадец. For fun, let’s do a celebrity quiz. I’ll name a famous person, and you say his or her nationality. Ready? Here’s the fact of the matter: Your pronunciation needs to be just good enough so that native speakers understand you. That’s it. End of story. You will never speak Russian without an accent. Never. And you’ll never fool a Russian speaker into thinking you’re a native speaker. Neither will I. But so what?! All that matters is that you speak well enough to be understood. I mean, what does it even MEAN to speak without an accent? Think about English. What is the correct pronunciation? American? British? Australian? If American, then which American accent? New York? Boston? The Southern drawl? That dry, Chicago accent? If British is the correct accent, then which British version? North London? Cockney? Scottish? Irish? As long as we understand each other, that’s what counts. And it kills me when native Russian speakers give students of Russian a hard time, and criticize their pronunciation. I have never met a single Russian speaker in the US who doesn’t speak without a brutally thick accent. I’ve met Russians in the U.S. who’ve been living there for thirty years and speak English well, but gimme a break…the instant they open their mouth — with just a single word — it’s immediately obvious they’re Russian. Хэлло Марк. Хау ар ю? But again I say: So what? We understand them. They can function in our society. They can communicate. End of story. So please…do not obsess about trying to perfect your pronunciation. But do check with a native speaker from time to time to be certain they understand what you’re saying. That’s why we include access to our native speaking Success Coaches with Russian Accelerator. You just need to know that your speech is understandable. Anyway, that rant is over, let’s learn two more words and then put it all together. Then you gesture to Christina. And Christina is your подруга. We know Pat is your друг…your male friend. In this case, we know Pat is a female friend. By the way, please don’t think of подруга as meaning your “girlfriend”. There’s no romantic associations with the word. It’s simply a friend who is female. And if you’re a guy with a Russian girlfriend, don’t ever call her your подруга because it immediately makes her “just a friend.” We’ll learn the word for “girlfriend” — the kind with romantic overtones — in a future podcast. (Anyway,) let’s put all this together. Answer: Yes. This is my friend John. Да. Это мой друг Джон. Is this your female friend? Yes. This is my female friend Monica. Да. Это моя подруга Моника. This is my friend Leyton. He is an Australian. Это мой друг Лэйтон. Он – австралиец. This is my friend Nicole. She is an Australian. Это моя подруга Николь. Она – австралийка. My mom is a Canadian. My father is an Englishman. This is my friend Charlie. He is a Canadian. Это мой друг Чарли. Он – канадец. This is my female friend Louisa. She is English. Это моя подруга Люиса. Она – англичанка. If you got all these, you really are making awesome progress in Russian. In the next podcast we’ll learn about greetings and introductions, plus I’ll show you a great tip for maximizing your study time. As always, I’ve put an “exercise-only” version of this on my site, RussianMadeEasy.com, so be sure to head over there and download that. That’s where you’ll find the transcript as well. And in the meantime, keep on practicing. I’ll see you in the next episode. Thanks a million. It is so easy to follow and understand. Great series! I have studied a number of different languages at various points, and your Tip of the Day here is absolutely right! Aaaamen! It’s so easy to have so much anxiety about the wrong things that we become too afraid to try at all. 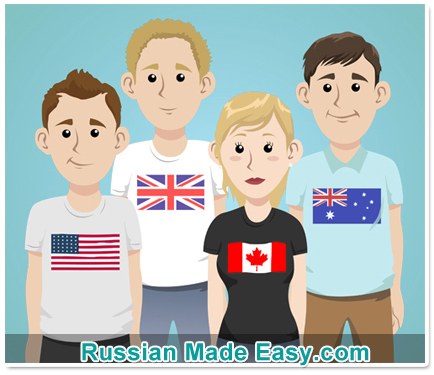 I greatly appreciate the friendly, easy-going approach with this series and it’s helping me to overcome a lot of previous exasperation I have had in trying to learn Russian. Amazing podcasts. So easy to follow and retain information from. Really appreciate the effort you’ve gone into for these. Thanks, from Australia. Let me know how you do on the id-term (podcast #10) and the final (#30). And maybe we’ll see you in my online video course, Russian Accelerator. I love your podcasts, I’d have given up on learning Russian if I hadn’t discovered these. Your voice is perfect for it, and your methods are the best! I can’t wait until I reach the final podcast and see how i progressed. I am from Belgium and I speak Dutch. So when I want to introduce myself in Russian, how do i say ‘I am from Belgium’? Thanks for these brilliant podcasts Mark. I’m using them in conjunction with an app of yours I found in the iOS App Store that teaches how to read the Russian alphabet. I’ve just started with Russian because I want to be able to read online Russian news media. I’ve only been learning for four weeks and I can already figure out quite a few headlines thanks to your app and these podcasts. I wish Gaeilge had it’s own alphabet, some sounds just don’t work with the Latin alphabet so I’m glad Russian has its own. I think it actually makes pronunciation easier when you learn what the letters sound like. IMO apart from Ё they seem to stick to the phonetic rules better than English does with the Latin alphabet. I’m enjoying your style of teaching too, no fuss, just to the point with the good stuff that actually helps you to learn. Many thanks. Thanks for the kind words about my podcast and my alphabet app. So glad you’re enjoying them. It would help much if you could post positive reviews about one or both, on iTunes and/or the app store. And yes, I would say Russian’s Cyrillic alphabet is **orders of magnitude** more phonetic than English’s. Thanks again, and let me know how you do on the final exam (Podcast #30)! I am Mexican and planning a trip to Russia for next year. I can not think of a more intimidating language to try to learn than russian. Although I have only gone through the first 3 episodes I actually feel like trying to learn some russian before my trip is not such a crazy idea after all. I hope to welcome you to my Russian Accelerator course after you finish my podcast. In the meantime, keep up the great work! That sounds like a wise career move. Check back in after the mid-terms (Podcast #10 and #20) and let me know how you’re doing. Today I purchased your trial of Russian Accelerator. Love it so far but I have a question. How should I make the Flashcard for ‘A’? Since it’s used as ‘so’, ‘but’, ‘whereas’, ‘and’, I wonder how exactly I should Organize the Flashcard? Just saw your question about making a flashcard for ‘A’. I probably wouldn’t make a flashcard for ‘A’. Instead, I’d write it in my grammar notebook. (Are you making one of those?) And then include all three meanings, including an example sentence for each. I’ll have coffee, whereas she’ll have tea. Ya budu kofe, a ona budit chai. I just found your podcast. Still getting through em. I have been into Russian since 2017 as i am very fan for cyber security n stuff. Plus, there is one company that i follow into – the Group-ib. Thus motivate me to learn even more. Thanks, Mark. God bless you. Thanks buddy I have no words to describe my gratitude….I am feeling like to hug you my friend..